A 104-year-old Australian scientist burst into song Wednesday as he told a roomful of journalists that he was looking forward to finally being allowed to end his life. David Goodall does not have a terminal illness but says his quality of life has deteriorated significantly in recent years and that he wants to die. "I no longer want to continue life," Goodall told the dozens of journalists and television crews who had crammed into a small room at a hotel in the northern Swiss city of Basel to hear him speak. "I am happy to have the chance tomorrow to end it, and I appreciate the help of the medical profession here in making that possible," he said. When asked whether he had chosen any music to listen to in his final moments, he said he hadn't thought about it. At 104 years old, Australia's oldest working scientist traveled to Switzerland so he could die by doctor-assisted suicide. "But if I had to choose something, I think it would be the final movement of Beethoven's ninth symphony," he said, before belting out a verse from the Ode to Joy, in German, to loud applause. Goodall was barred from seeking help to end his life in Australia, so he was forced to travel to Switzerland, something he has said he resents. "I would have preferred to have (ended) it in Australia, and I greatly regret that Australia is behind Switzerland" when it comes to right-to-die laws, he said. The 104-year-old said he hoped the widespread interest in his case would spur Australia and other countries to rethink their legislation. "I would quite like to be remembered as an instrument of freeing the elderly from the need to pursue their life irrespective," he said. The honorary research associate at Perth's Edith Cowan University set off from Australia a week ago, and stopped in Bordeaux, France to see family before arriving in Basel on Monday. He was speaking alongside Philip Nitschke, the founder of Exit International which helped him make his final journey, and Moritz Gall of Eternal Spirit, the Swiss foundation that has agreed to help him die. Goodall secured a fast-track appointment with the foundation after he attempted but failed to commit suicide on his own earlier this year. "It would have been much more convenient for everyone if I had been able to, but unfortunately it failed," he said of the suicide attempt. But he said he was happy that he had been offered the "Swiss option", since he has been able to see most of his large family, which is spread over several countries, in the run up to his final day. Assisted suicide is illegal in most countries and was banned in Australia until the state of Victoria became the first to legalise the practice last year. But that legislation, which takes effect in June 2019, only applies to terminally ill patients of sound mind and a life expectancy of less than six months. According to Swiss law meanwhile, anyone who is of sound mind and who has over a period of time voiced a consistent wish to end their life can request so-called assisted voluntary death, or AVD. 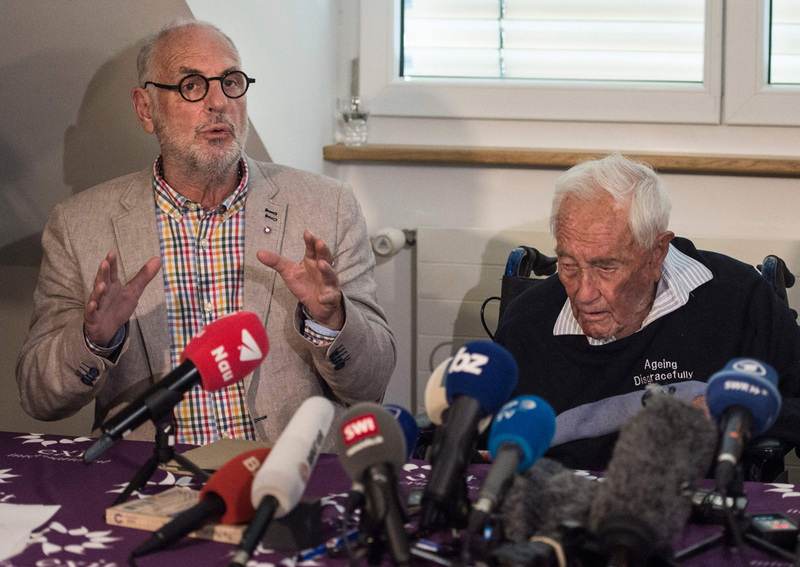 Eternal Spirit, one of several foundations in Switzerland that assist people who want to end their lives, said Wednesday that Goodall had undergone two medical visits by different doctors since arriving in the city. "Tonight the board of the foundation will study the documents and also judge the wish to die of David Goodall," Eternal Spirit head Erika Preisig said in an email, adding that the answer would "likely" be yes. But Gall stressed to reporters that Goodall had the option until the very last minute to back down if he changed his mind. Asked if he had any hesitations or doubts, the 104-year-old said: "No. None whatsoever." In assisted dying, the person must be physically capable of carrying out the final deed on their own. Most Swiss foundations ask patients to drink sodium pentobarbital, an effective sedative that in strong enough doses causes the heart muscle to stop beating. Since the substance is alkaline and burns a bit when swallowed, Eternal Spirit has instead opted for intravenous infusions. A professional prepares the needle, but it is up to the patient to open the valve that allows the short-acting barbiturate to mix with a saline solution and begin flowing into their vein. Goodall said he expected his death to take place around noon on Thursday. Exit International and Eternal Spirit are advocating for all countries to introduce systems similar to the Swiss one, allowing people to choose to die "in dignity". "This is a human right, to be able to make an elected decision by a rational adult to take this step," Nitschke said.